Terrain Parks – Slopestyle snowboarding has found a home in the many terrain parks the worlds resorts are now building. Yesssss!! Progression is beautiful. Most have a variety of Sliders and Terrain Park Jumps, and Hips and Spines in all types and sizes to work with. Using a progression from the smaller jumps to the biggest in the park a Park Rider progresses their skills and bag of tricks. The slopestyle rider uses a Freestyle Setup. Usually jump and rail riders like a Snowboard, Boots and Bindings with a softer than average flex, this makes the set up more forgiving in the takeoff and landings of jumps and makes it easier to lock onto rail tricks and butter or press slider tricks. They also commonly like using less forward lean on binding highbacks and a wider than average stance. This provides more stability on rails and sliders as well as on takeoffs and landings of jumps. However, the wide stance can work against the riders’ ability to pump transition and have precise board control on the snow. So, it’s a good idea for the rider to experiment and find the best stance for their personal goals and style. The ability to accurately judge the correct speed to approach any feature to execute the move and land in a safe area of the landing. This takes time and good intuition to develop. Some riders like to wait until someone else has tested the speed, then follow that rider to judge their own speed for that feature. Good air awareness and the cat like ability to get your feet back underneath you no matter what. Fearless and confident approach to hitting the features. Second guessing and hesitation can lead to bad timing and nasty falls. Creative approach to learning and developing ability. 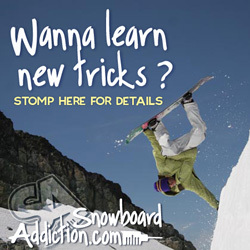 To point out a generality, the wider stances and softer boards lead to a common Slopestyle style that is more upright in stance and less focused on carving skills. Slopestyle has developed such an amazing personality all its own. The riders are full lovin and crazy.